This artist's view shows the COROT satellite, launched in 2006 to search for extrasolar planets by monitoring changes in a star’s brightness that come from a planet crossing in front of it. Scientists have discovered a new Jupiter-sized planetorbiting around a distant sun-like star. The planet, called CoRoT-Exo-4b, was discovered by theEuropean Space Agency's CoRoT space telescope, which was designed to searchfor extrasolar planets by looking for transits, or tiny dips in the lightoutput from a star when a planet passes in front of it. By tracking the time between transits, a team of scientistsled by the French space agency CNES found that the planet takes 9.2 days torevolve around its star - the same period of time its star,which is slightly larger than our sun, takes to rotate 360 degrees. They wereable to derive the star's period of rotation by monitoring dark spots on itssurface that rotated in and out of view. "We don't know if CoRoT-Exo-4b and its star have alwaysbeen rotating in sync since their formation about 1 billion years ago, or ifthe star became synchronized later," said University of Exeter researcher SuzanneAigrain. The researchers said the finding is surprising because theplanet is thought to be too low in mass and too distant from its star to have astrong enough gravitational pull to influence its rotation. This is the first transiting exoplanet found with such apeculiar combination of mass and period of rotation. 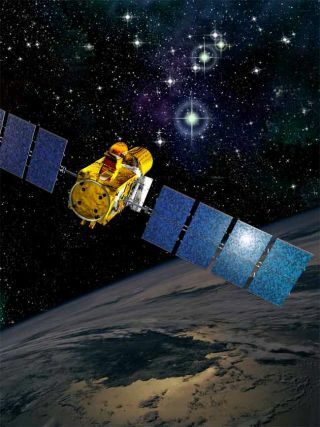 The scientists say theyhope CoRoT, which launched in December 2006, will help them discover thespecial circumstances of the planet's formation and evolution. "CoRoT will no doubt find manymore transiting planets, and by systematically measuring their host stars'rotation periods we will gain valuable insight into how stars interact withtheir planets," Aigrain said. The research team presented the CoRoT-Exo-4b findings todayat the Cool Stars 15 meeting at St Andrews University in Scotland.